Colombian President Juan Manuel Santos won the 2016 Nobel Peace Prize today (7 October) for his efforts to end a 52-year-old war with Marxist rebels, a surprise choice and a show of support after Colombians rejected a peace accord last Sunday (2 October). EU leaders congratulated Santos. “The Nobel Peace Prize is a tribute to my good friend Juan Manuel Santos’ efforts with FARC and encouragement to pursue historic deal,” tweetted Donald Tusk, President of the European Council. “Congratulations to Nobel Prize winner, Colombian President Juan Manuel Santos – from a continent of peace to a country whose peace is dawning”, tweeted Commission President Jean-Claude Juncker. Congratulations to #NobelPrize winner, Colombian President @JuanManSantos – from a continent of #peace to a country whose peace is dawning. 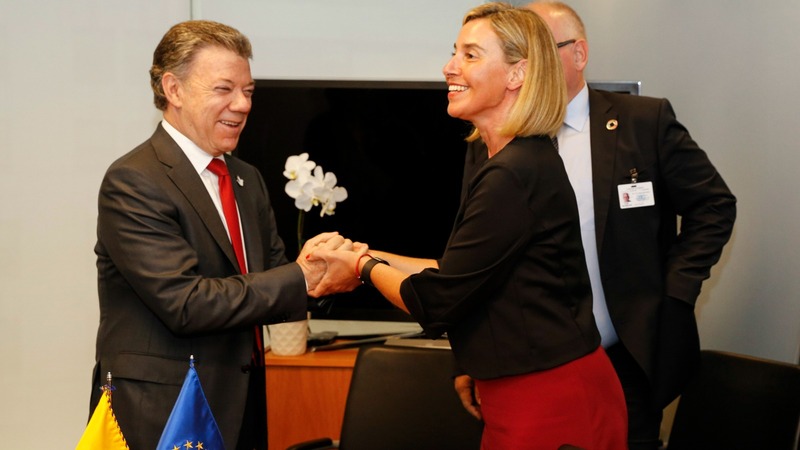 The EU has invested a lot of efforts in the Colombia peace process, but two days ago it announced it would suspend a development fund earmarked for Colombia, following a referendum in which voters rejected a peace deal with the FARC rebel group. The European Union announced Wednesday (5 October) it would suspend a development fund earmarked for Colombia, following a referendum in which voters rejected a peace deal with the FARC rebel group. The Norwegian Nobel Committee said Santos had brought one of the longest civil wars in modern history significantly closer to a peaceful solution, but there was still a danger the peace process could collapse. The award excluded FARC guerrilla leader Rodrigo Londono, better known by his nom de guerre Timochenko, who signed the peace accord with Santos in Cartagena on 26 September. Santos has promised to revive the plan even though Colombians narrowly rejected it in a referendum on Sunday. 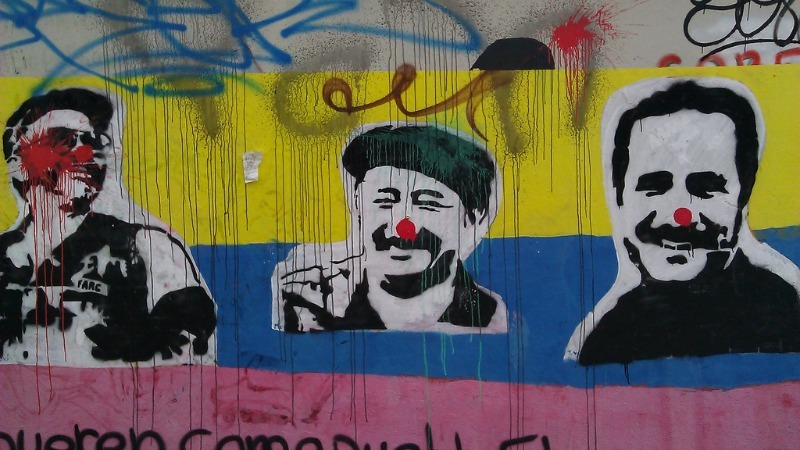 Many voters believed it was too lenient on the FARC guerrillas. “There is a real danger that the peace process will come to a halt and that civil war will flare up again. This makes it even more important that the parties, headed by President Santos and FARC guerrilla leader Rodrigo Londoño, continue to respect the ceasefire,” the Norwegian Nobel Committee said. “The fact that a majority of the voters said “No” to the peace accord does not necessarily mean that the peace process is dead,” it said. More than 220,000 people have died on the battlefield or in massacres during the struggle between leftist guerrillas, right-wing paramilitaries and government troops. Millions have been displaced and many beg on the streets of the capital, while economic potential has been held up in the mostly rural nation. The committee quoted Santos as saying the award would help further the peace process. “He was overwhelmed. He was very grateful. He said it was of invaluable importance to further the peace process in Colombia,” committee secretary Olav Njoelstad told Norwegian state broadcaster NRK after having spoken to him by phone. Colombia’s ambassador to Norway, Alvaro Sandoval Bernal, said it was a message of hope for his country. Asked why Londono was left out, committee leader Kaci Kullmann Five said Santos had been central to the process. She declined to elaborate on Londono’s role. The rebel leader’s initial reaction indicated no disappointment that he had been left out. “The only prize to which we aspire is that of peace with social justice for a Colombia without paramilitarism, without retaliation nor lies,” he wrote on his Twitter account. Santos is the first Latin American to receive the peace prize since indigenous rights campaigner Rigoberta Menchu of Guatemala won in 1992, and is the second Colombian laureate after writer Gabriel Garcia Marquez, who won the literature prize in 1982. The scion of one of Colombia’s most prosperous families, Santos was not thought likely to spearhead a peace process with FARC (the Revolutionary Armed Forces of Colombia). But though he had served as defence minister under hardline ex-president Alvaro Uribe, when the FARC were weakened by a US-backed offensive, Santos used his two terms in office to open negotiations with rebel leadership at four-year-long talks. His family once owned leading Colombian newspaper El Tiempo, where Santos worked as an editor before turning to politics. He also trained as an economist at the London School of Economics. He was finance minister in the 1990s, helping to steer the Andean nation through one of its worst fiscal crises. The peace talks made bitter enemies of Santos and Uribe, who accused his former protege of betraying FARC victims, and who founded a new right-wing political party and won a Senate seat, in an effort to undermine Santos’ peace efforts. The news may anger those Colombians who see Santos’ bid for peace with the FARC as selling out the nation as he negotiated terms that they see as an embarrassment. But the fact that his rebel foe did not receive the prize alongside him may be a relief to Santos, given the political tension following referendum. On the other hand, it may give Santos the moral upper hand in talks with Uribe. A joint win may have set back sensitive talks with the opposition as Santos tries to negotiate new terms with the “No” camp and possibly convince the FARC to accept changes to the original accord. The “No” vote was a disaster for Santos, who had hoped to turn his focus quickly to other matters including possible talks with the smaller ELN rebel group, tax reform and other economic measures to compensate for a drop in oil income. Colombia is struggling to save a peace deal that stumbled at the last hurdle, when the country’s citizens voted to reject an agreement that would have put an end to decades of conflict. 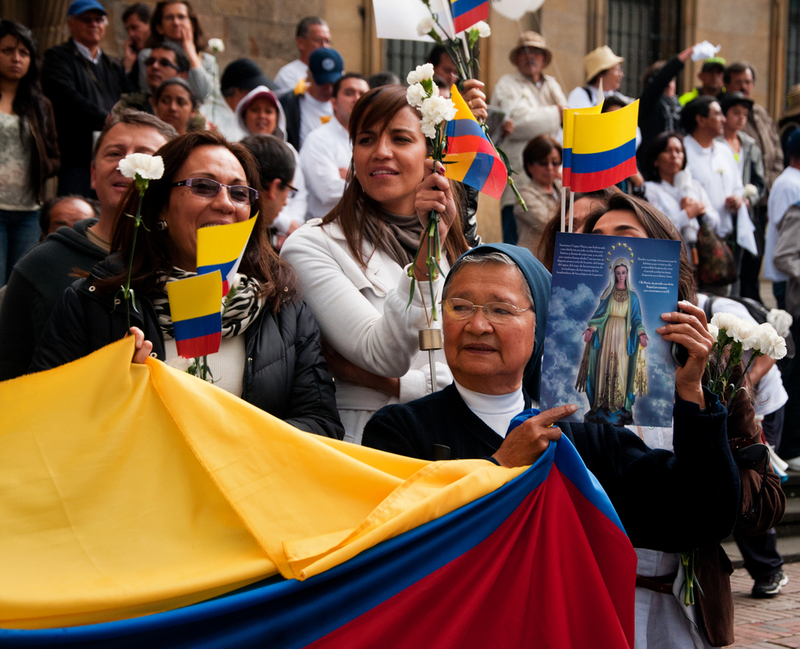 Some Nobel watchers had taken Colombia off their lists of favourites after the referendum “No”. “The peace accord was indeed a major achievement and, although the referendum was a setback, hopefully this award will help peace builders maintain the momentum needed to keep the process moving forward,’ Stockholm International Peace Research Institute Director Dan Smith said in a statement. The United Nations human rights office, which does not usually comment on Nobel Peace Prizes, said the award was a recognition of how important the conflict in Colombia was. “I think the High Commissioner would hope this gives a big boost to the peace process which has been going through a bit of a roller coaster in the past few weeks,” U.N. human rights spokesman Rupert Colville said in Geneva. The one-sided prize echoes previous awards, such as to South Korean President Kim Dae-jung in 2000 for his work for reconciliation with North Korea. West German Chancellor Willy Brandt won in 1971 for his policies of reaching out to the communist East. But often the awards go to both sides in peace negotiations, such as to Israelis and Palestinians in 1994 or to Egypt’s Anwar Sadat and Israel’s Menachem Begin in 1978. The Nobel Peace Prize, worth 8 million Swedish crowns ($930,000), will be presented in Oslo on 10 December.